Abstract: "Slow" and "Stopped" light have had a surge of interest. Slow light is a coined phrase which has been used to describe a slow group velocity of a pulse in a medium. The ability to tune the group velocity has potential applications in telecommunications, all-optical routers and buffers, remote sensing and optical pattern recognition. I will discuss some of our recent experimental results: Fourier transform interferometry, image buffering and preservation and entanglement preservation. Stopped light has been equally intriguing. In a stopped light system, a light field is mapped onto an internal degree of freedom in the medium such as an atomic spin wave. This has potential a low light level memory device such as a quantum memory. I will discuss one of our recent experiments in which we were able to store and preserve an image. Biography: Prof. Howell received his B.S. in Physics (1995) with a minor in Mathematics from Utah State University, and his M.S. and Ph.D. in Physics (2000) from Pennsylvania State University. He then took a postdoctoral research position at the Centre for Quantum Computation at the University of Oxford. 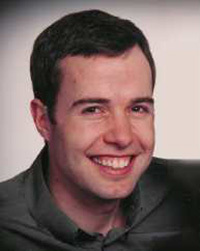 Prof. Howell joined the University of Rochester in 2002, as Assistant Professor of Physics. Howell received a Presidential Early Career Award for Scientists and Engineers in 2004, a Research Innovation Award from the Research Corporation in 2004, a Presidential PECASE Award in 2005, and the Adolph Lomb Medal from the Optical Society of America in 2006 "For innovative contributions in quantum optics, particularly aspects of quantum cloning, violations of Bell's inequalities and maximal photonic entanglement."